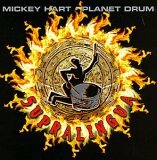 Supralingua is Mickey Hart's finest record to date. On this effort, Hart takes every percussive sound and feeling that he's explored over the course of his career and molds them into a unique, cohesive, and fluid outpouring of tribal emotion. Hart, bassist Bakithi Kumalo, and Planet Drum members Zakir Hussain, Giovanni Hidalgo, David Garibaldi, and Sikiru Adepoju tap into the percussive soul of mankind's heartbeat, churning out polyrhythmic textures to create a soothing meditative and utterly religious experience. Hart draws not only upon his past aural paintings with Planet Drum, but also upon his collaborations with the Gyoto Monks, which adds a supernatural aura to Angola. He also applies his experiences with the Mystery Box album and tour in creating much tighter song arrangements while allowing a natural groove to form and flow. Instead of the Mint Juleps, on this excursion Hart digitally processes the vocals of Gladys Céspedes, Jesus Diaz, Rebeca Mauleón, Raz Kennedy, Joey Blake, and Alan Kushan. Hart explains, "It's very, very hard to come up with the vocals that go with these rhythms. Drums and voice go together quite naturally, but not necessarily drums and words. Most of it is not really words with any literal meanings, they're phonetics. Beyond language, beyond words, that takes you to another emotional places, that's what we call the supralingua." Hart has long experimented with applying technology to the vast realm of percussion, and Supralingua yields the fruits of his labor. Throughout the endeavor, he employs a state-of-the-art computer workstation called RAMU (Random Access Musical Universe). Said Hart, "RAMU is me. It's a dream instrument, an encyclopedia of sound. You can jump from rain forest to gamelan to jungle drums. It's truly extraordinary because it can contain an entire universe of sound." How often do drums and samples sound natural in the music in which they are employed? Very rarely. Not so on Supralingua. Hart uses them to his advantage, creating percussive loops and samples that come from the depths of mankind's soul. Supralingua is a serious, mind-bending, psychedelic journey. It's a surreal, spiritual experience that is full of rich textures and dense grooves. Anyone even remotely curious about the power of drumming will find not only that the album's forceful energy is immediately overwhelming but also that it will lead to enlightenment. Supralingua is available from Barnes & Noble.